Often non-specific, but back pain (due to vertebral collapse with osteoporotic change or lytic lesions) is an exam classic. Similarly pathological fractures or unexplained osteoporosis are one route to diagnosis. Hypercalcaemia may develop and is an unusual but important presentation – remember those ‘bones, stones and psychic groans’. And more importantly polyuria and polydipsia. Medical students should be aware of hypercalcaemia as one of the key oncology emergencies to come up in exams. Tweet us about this if you want to know more. 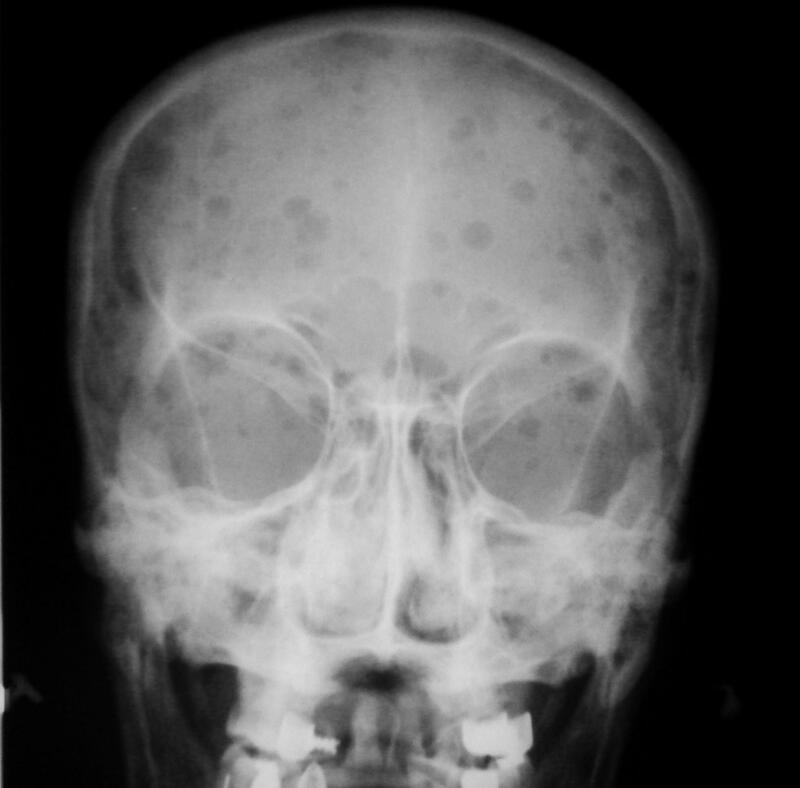 Recurrent infection due to hypogammaglobulinaemia is a feature in some patients. ANAEMIA – this is normocytic anaemia, with normal haematinics and a normal platelet and white cell count. The blood film will be normal in nearly all cases. SERUM ELECTROPHORESIS WITH IMMUNOFIXATION – this is a test in which a serum sample is placed on gel plate and an electrical charge is applied. The proteins travel a set distance depending on their size and thus several peaks are seen in healthy patients – representing albumin, immunoglobulins of different sizes, carrier proteins and so on. In patients with myeloma there is a clone of lymphocytes (plasma cells) which are producing just one immunoglobulin, resulting in a large ‘spike’ in the gamma zone. This paraprotein or M-protein (i.e. malignant or abnormal) can then be sub-classfied in the lab as being an IgA, IgG, IgM, IgD or IgE (IgG and IgA being far more common in Myeloma). The details of why this matters is beyond the scope of non-haematologists but it is important in prognostication. A lot of confusion seems to arise in interpreting the results issued by the labs. 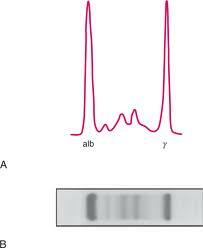 A paraprotein will be quantified by the lab and reported as such – e.g. ‘IgG 25g/dl, paraprotein 19g/dl, paraprotein is an IgG kappa’. If the Ig levels are elevated but there is no monoclonal spike the lab will usually make a comment along the lines of ‘polyclonal increase in the gamma zone’ – which is non specific and reflects inflammation, infection and so on. ses the plasma cells only produce light chains, with no paraprotein. This is the reason that patients with suspected myeloma should have their urine tested for bence jones proteins – BJPs are just light chains that pass into the urine. 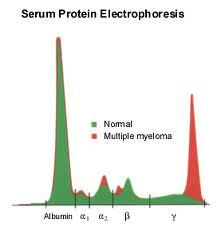 Our ability to test for serum free light chains has really only developed in the last few years and it is still expensive, so most people will test urine for BJPs where suspicion is low; where suspicion of myeloma is high SFLCs will be tested for. An important footnote with SFLCS is that in renal failure the levels and ratio of SFLCs will be abnormal and the results should be carefully interpreted in this context. More on renal failure later. Patients who present with severe progressive back pain should be carefully assessed for neurological signs and symptoms as spinal cord compression is a dreaded complication and is another oncology emergency. MRI is the imaging of choice in this context and must be done urgently – even if this entails transfer to another hospital in the middle of the night. Please see references for further reading on spinal cord compression. Collapse of vertebrae can lead to severe intractable pain and the orthopaedic team might consider kyphoplasty or vertebroplasty (injecting cement into a vertebrae) to improve the anatomy and relieve pain symptoms. Imaging of the spine (MRI or CT) is useful in deciding whether this is likely to help a patient. To clinch the diagnosis a bone marrow aspirate (to look at the cell shape- cytology) and trephine (to look at the tissue structure – histology) is required. This will demonstrate an infiltrate of plasma cells. For MRCP you should be able to identify these – they are large, dark blue and have an eccentric nucleus (i.e. off to one side). New guidance suggests that flow cytometry should be used to demonstrate clonality – that is that all the plasma cells are identical and express proteins that shouldn’t normally be there. This is done by mixing the aspirate (liquid) marrow with fluorescent labelled antibodies and passing it through a machine to see which antibodies have bound to the proteins expressed by the plasma cells. Aside | This entry was posted in Laboratory morphology, Myeloma/paraproteins and tagged emergency, myeloma, renal failure, spinal cord compression. Bookmark the permalink.